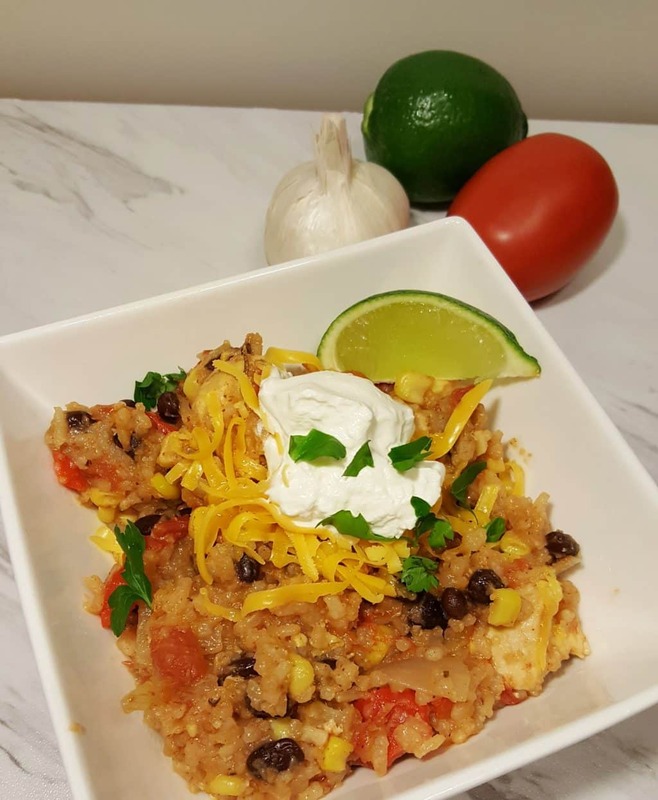 Pressure Cooker Chicken Taco Burrito Bowls, with a Mexican flair are made with good and wholesome ingredients, can be on your table in under 30 minutes. 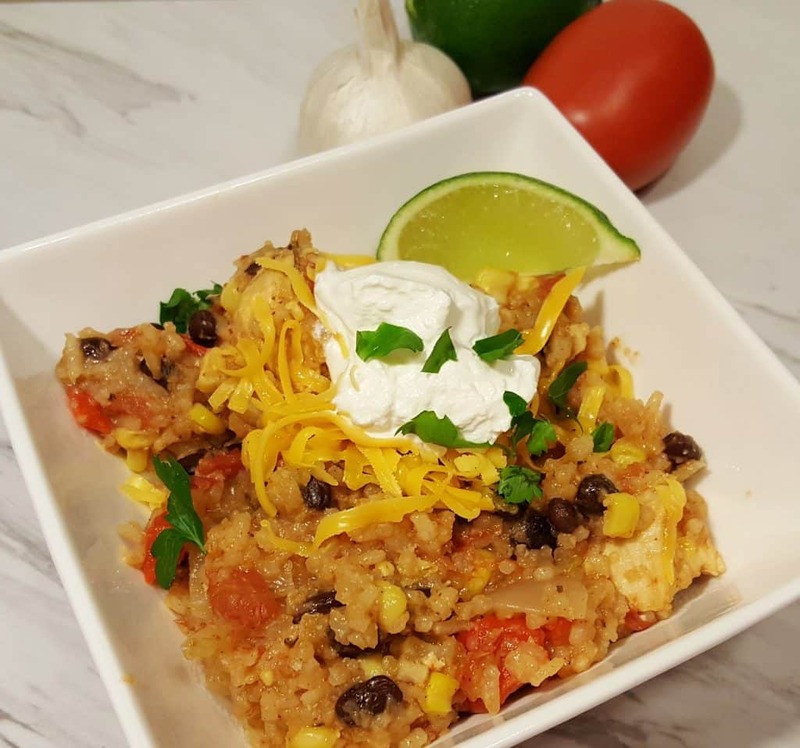 Instant Pot Chicken Taco Bowls. Here is a really quick, easy and delicious week night meal. There is really no planning and you can throw it together in yourInstant Pot or Pressure Cooker, with only a moments notice. 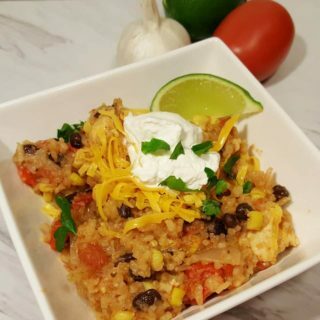 These Pressure Cooker Chicken Taco Burrito Bowls made with Rice in ONE POT, is a very flexible recipe. Choose to make your own Salsa with a couple cans of Diced Tomatoes, and some other ingredients, or you use Fresh Salsa (Costco makes a nice one) or Jarred Salsa. 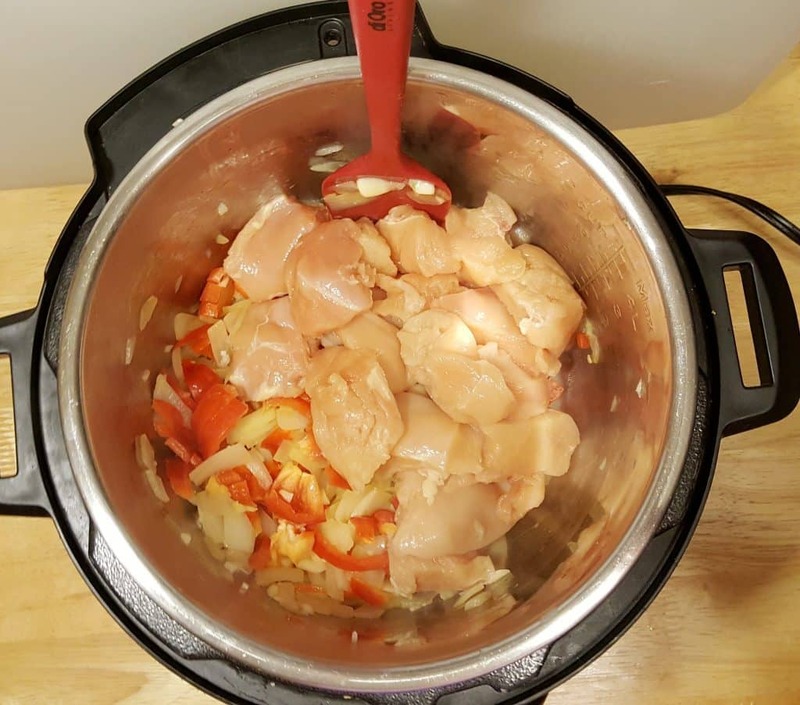 By all the emails I get about my Pressure Cooker One Pot Chicken and Rice recipe, I figured you all might want another One Pot Chicken and Rice recipe. So, here you go! You can use a couple cans of Rotel Mexican and/or Diced Tomatoes, whichever you like. If you use Jarred Salsa or Fresh Salsa, leave out the Onion, Garlic and Diced Tomatoes from the recipe. Don’t forget to make up a batch of my This Old Gal’s Simple Guacamole to go along with your Taco Bowls. Place the Rice into a Japanese Rice Washer. 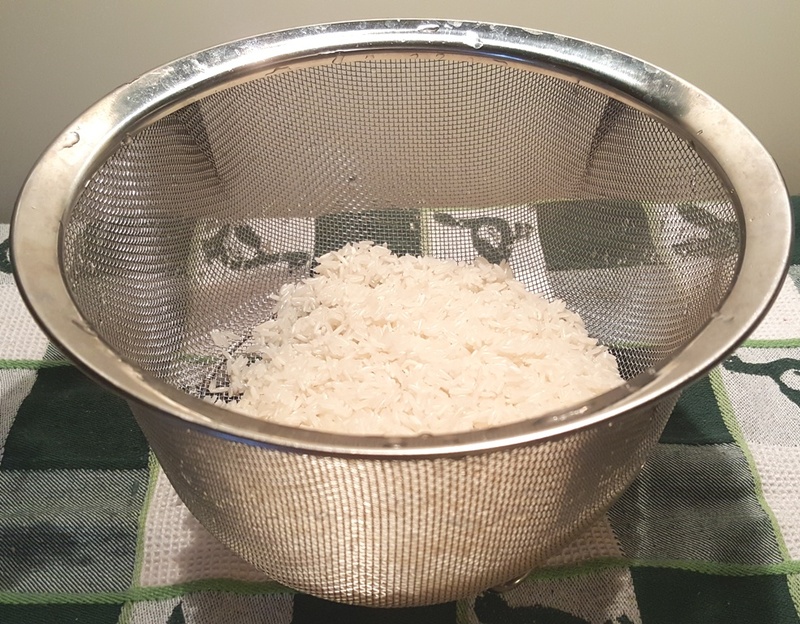 My Salbree Steamer Basket does double duty, so I just use it to thoroughly rinse my rice. Make sure to rinse the Rice until the water runs clear. Jasmine Rice is my most used Rice, next to Brown Rice. Set the Rice aside, until you are ready to dump it into your Pressure Cooker. Assuming you will be making your own Salsa from scratch, heat your Pressure Cooker cooking pot and allow to fully heat. This will help to make your Stainless Steel cooking pot non-stick. 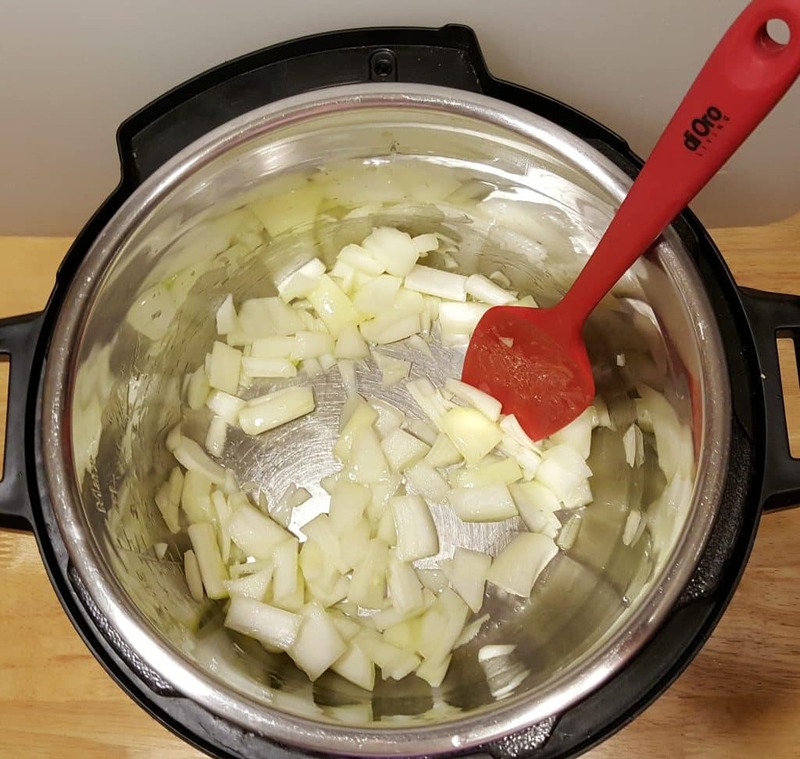 Add the Chopped Onions and use a Spatula to Sauté until they begin to soften, about three minutes. Add in your Chopped Red Peppers and Sauté with the Chopped Onions for about a minute and then toss in the Minced Garlic. Don’t allow the Garlic to burn, just mix it into the Vegetables. Pour in your Homemade Chicken Broth and Deglaze your cooking pot by scraping the bottom with your Spatula to loosen up any brown bits that are stuck. Turn off the Pressure Cooker. If you are using Jarred Salsa or Fresh Salsa, add chopped Red Peppers and then add the Chicken Broth and the Chicken Chunks. Dump in the Packet of Seasoning, Beans, Corn, Cilantro and squeeze all the juice from the Lime. If you don’t want to use a Packet of Seasoning, make up a batch of my Taco Seasoning and use that instead. I keep a big batch made, so that I can just grab a couple of Tablespoons instead of using a Packet. But, to make this a quick meal, I have shown you this recipe, using a Packet of Seasoning. If you want to give your Pressure Cooker Taco Burrito Bowls a flavor boost, add in a couple shakes of True Lime Garlic Cilantro. I keep bottles of the True Line of Crystalized Citrus and their True Citrus Crystalized Seasonings in my pantry at all times. The flavors are unmatched. The Citrus tastes like you picked the fruit right off your tree. I used a couple of teaspoons. You can spread around the ingredients, but don’t mix them up! 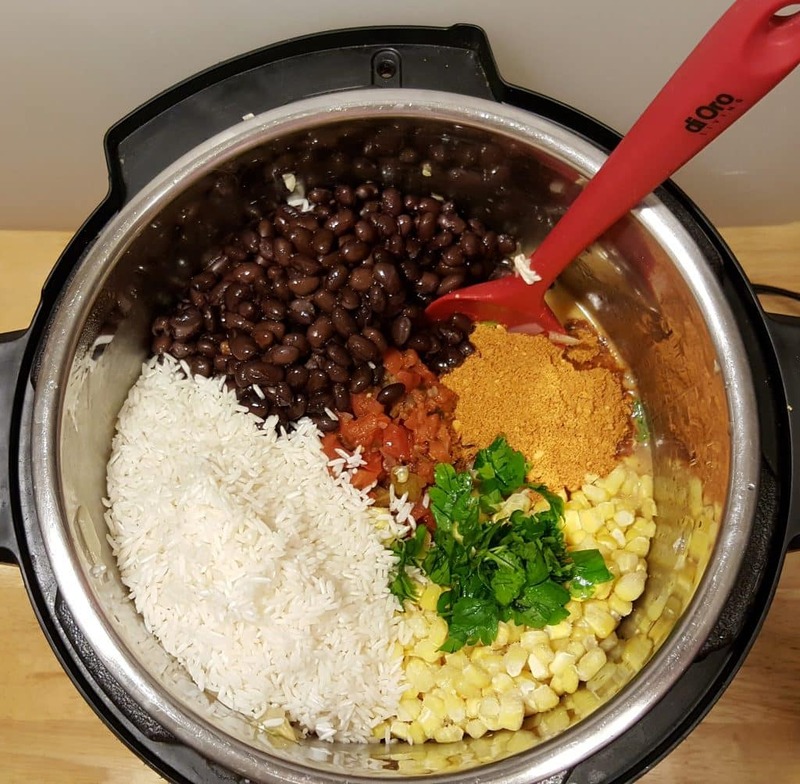 I just wanted you to see all of the pretty colors of this Pressure Cooker Chicken Taco Burrito Bowls recipe. Dump in the Jasmine Rice on top of everything. This will keep the Rice from becoming mushy. 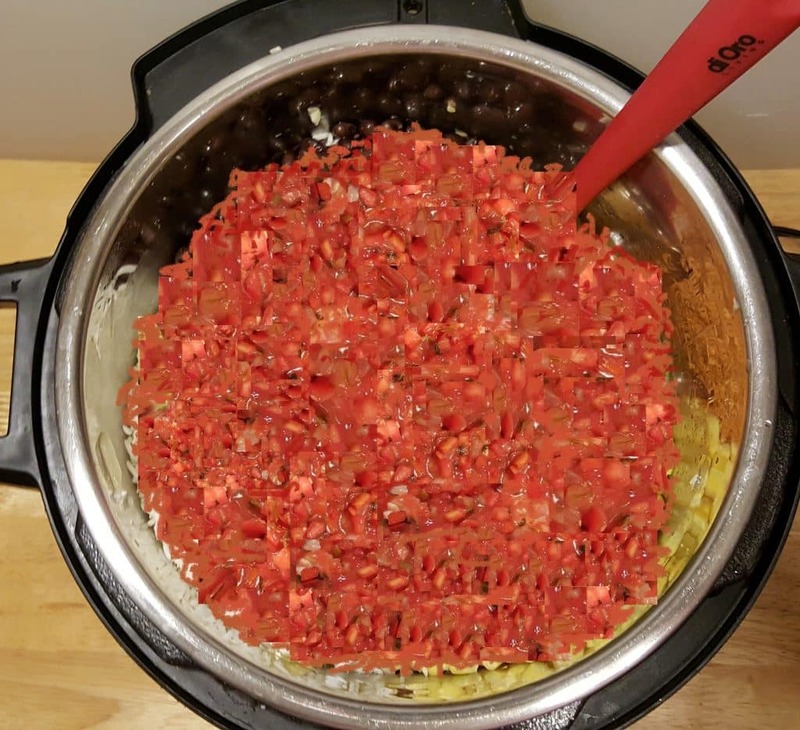 After all your ingredients are added, dump in a couple of cans of Rotel and Diced Tomatoes. You can make this dish as seasoned or not seasoned as you like. The Rotel Mexican Diced Tomatoes will add more lime and spices. If you prefer, use Jarred Salsa instead. That’s it and it is ready to be cooked. Remember, if you are in a hurry and do not want to make your own Salsa, skip the Sautéing of the Onions and Fresh Garlic. 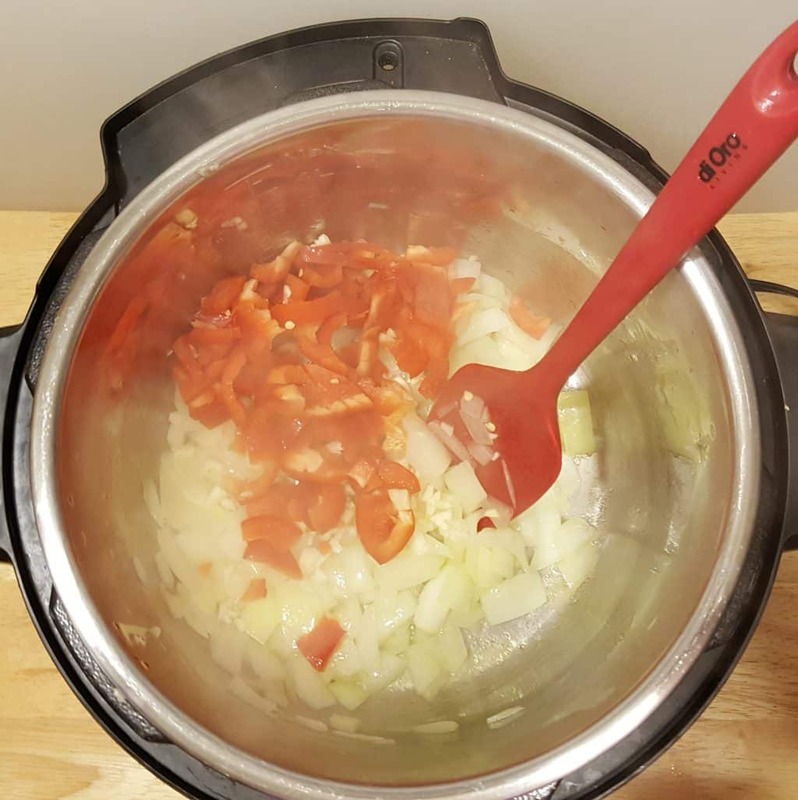 Instead, just add the Red Peppers, Chicken and Chicken Stock into the Pressure Cooker and then the rest of the ingredients. Grated Cheese, Sour Cream or Homemade Greek Yogurt, Fresh Cilantro, Fresh Diced Tomatoes and a wedge of Lime. This makes a great filling for Burritos and Tacos. How about a Mexican Chicken Tostada Bowl? 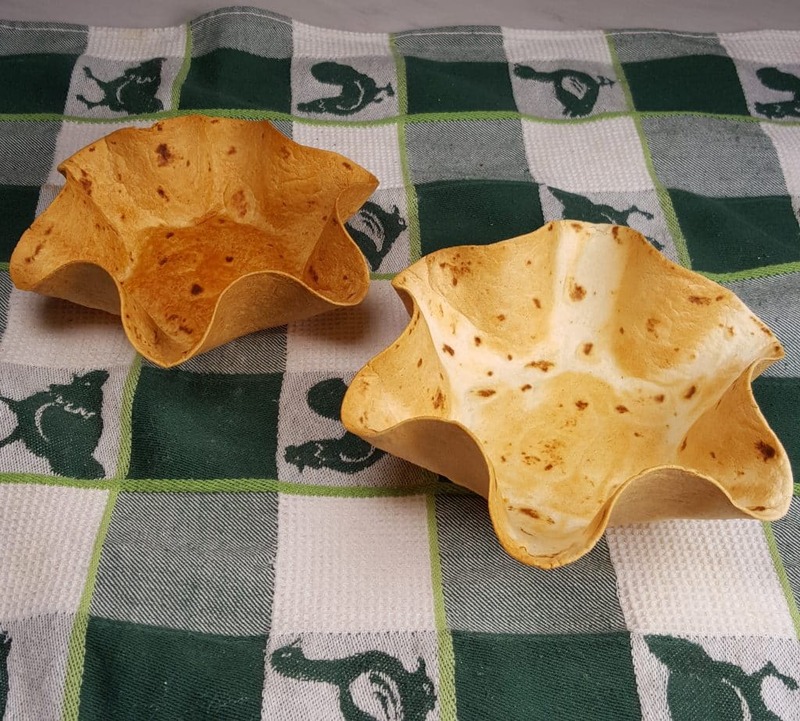 Turn any regular Flour Tortilla into a Crunchy Tostada Bowl by buying one of these Tostada Bowl Makers. You can even make your own Tortillas with my easy Yogurt Whey Indian Chapati / Roti (Flatbread) recipe! Don’t forget the Quick and Easy Guacamole!!!! Using the Sauté button, or other button, allow Pressure Cooker to fully heat. Add Olive Oil and Chopped Onions and cook for 3 minutes. Add Red Pepper and cook 1 minute. Add Minced Garlic and Sauté for 30 seconds. Add Chicken Broth and deglaze cooking pot. Make sure nothing is stuck to the bottom. Turn off Pressure Cooker. Add Chicken Chunks, Corn, Black Beans, Taco Seasoning, True Lime Garlic Cilantro, Lime Juice, Salt, Fresh Cilantro and Rice. Do not mix. Lastly, cover with Rotel and Diced Tomatoes. Lock on Lid and close Pressure Valve. Cook at High Pressure for 2 minutes. Allow a 5 minute Natural Pressure Release. Open pot and stir to combine. Garnish with Grated Cheese, Sour Cream, Fresh Cilantro and a Lime Wedge. Serve with Tortilla Chips, if desired. If using Salsa instead of making your own, use 32 oz minimum. If using Diced Tomatoes instead of Rotel, add extra onion, pepper and salt. Try my Homemade Taco Seasoning, instead of using a Packet. I like the sound of many of your recipes. However, not all of them give the number of servings. Are your recipes geared for a specific usual number of servings if the number isn’t listed? I honestly think that the number of servings is missing from the recipe card on this one. My rice did not cook. I follow the receipe. What do I did? If rice did not cook, what should I do? Any comments? In the instructions you refer to salsa, yet in the ingredient list there is no mention of salsa. How much salsa is to be used? It says in the recipe, use salsa OR canned Rotel and tomatoes. It give the amount for the Rotel and tomatoes so if you choose to use salsa just use the same amount. I recently received my Instant Pot and the first thing I made was this recipe. Delicious! But … my silicone seal now smells like taco. I tried soaking it in baking soda. I also tried doing the vinegar /steam cycle as recommended by Instant Pot. I made steel cut oats this morning and they smell like tacos! Have you had this problem? Do you have any suggestions on how I can get rid of the odour? Thanks! I use the top rack of my dishwasher to wash the silicon sealer. I also bought 3 extra seals for that I can use one for savory and one for sweet (or other). any changes to cook time if I use boneless, skinless thighs? The recipe calls for 15oz Rotel, Mexican Lime. Just wanting to mak sure you are saying to use 1 and a half cans of Rotel. Is that correct? I think it’s a type-o. Should be 10oz. I only caught it because the gram measurement between the regular diced tomatoes and rotel is different. Mom cilantro cause I bought parsley by mistake! Sooooo good!! Thanks for sharing your recipes!! This looks amazing. I have been looking for easy and healthy recipes for my IP. Any suggestions for using quinoa instead of rice? Thanks! Like the chicken burrito filling. How would I modify this to use brown rice? Ever find out? I want to make with brown rice too? Has any one tried doubling this recipe and did it turn out ok? Did you add additional time and was it in a 6 quart IP? how do I adjust the cooking time for frozen chicken? Made this dish last night and it was very delicious. Next time I make this I may only use 8 ounces of rice instead of 12 as we have a 6 qt I-pot and it’s a lot of food. Does anyone know if this freezes well? 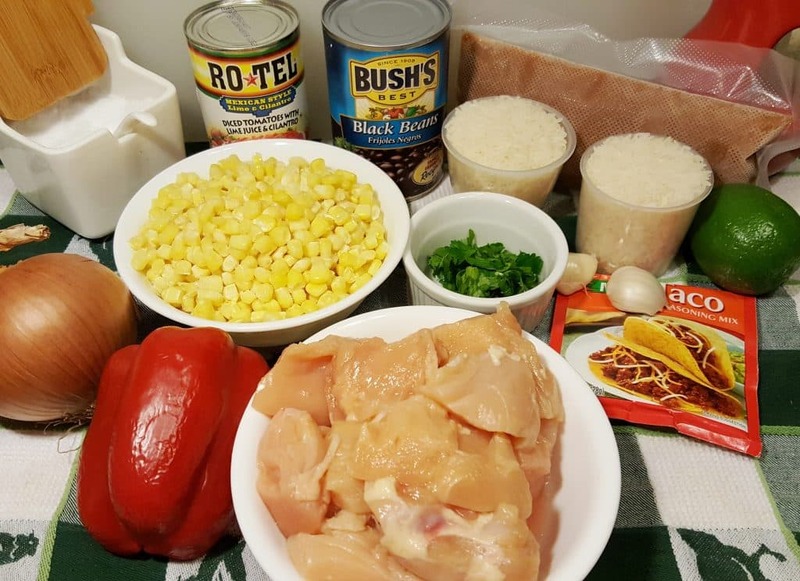 Please confirm the correct amount of rice to be used in the chicken taco bowl recipe. Per the blog, the 12 ounces of rice equals 220 grams. In your pressure cooker cookbook, the amount is listed as 340 grams. Or is it 12 ounces by volume (1 1/2 cups). Thank you for clarifying this.